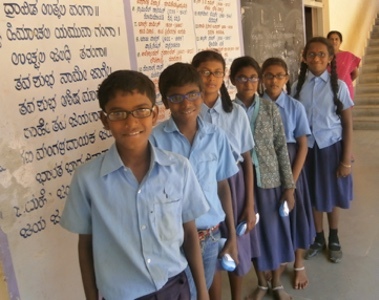 Drishti is a social impact enterprise that provides affordable eye care in under-served markets. Drishti is currently setting up hospitals and vision centers in markets that have limited or no provision for eye care. Our services are priced to enable even BOP segments to seek eyecare. Consultations at hospitals are priced at Rs 100, Prescription glasses are available from Rs 300 and Cataract surgeries from Rs 3800. We run out-reach programs to targetted BOP segments where consultations are free and glasses and surgeries are subsidised. Every Drishti centre runs 2 key programs with the support of Grants. Our school screening program covers all goverment school children in the taluk. Children are provided free glasses, medicines and where required surgery. In 2015 - 16, Drishti screened over 32,0000 children in government schools. Our village screening program provides free consultation in villages. Subsidised glasses and medicines are provided where support is available. Free eye surgeries are conducted for patients aged over 60 from villages. These surgeries are possbile due to a grant of Rs 1000 per surgery from donors. Our grant programs are possible thanks to the generous support of several companies and trusts. In 2015 - 16, Drishti provided free eye consultations to over 25,000 rural adults. Over 1000 free eye surgeries were conducted supported by grants. is a telecom engineer and was a founding member of OnMobile, a company spun out of Infosys. He helped build OnMobile from a 10 people startup to over 1200 people with revenues over 550 crores. He quit OnMobile in Dec 2010 to work on projects that deliver social impact. He was a Volunteer – Technology at UIDAI till Aug 2012 and co-founded Drishti with Dr Rajesh and Anjali. specialized first in Uveitis and has published several papers in the space. He worked at Shankar Nethralaya (Chennai) and Narayana Netralaya (Bangalore). His belief that many of the eye conditions must be caught earlier for the best treatment led him to persue an MSc in Public Health for Eye care at the ICEH, London (Home of the global Vision 2020 program). He is now focussed on building out the Drishti model for affordable eye care covering 1 district.